Honolulu – The U.S. 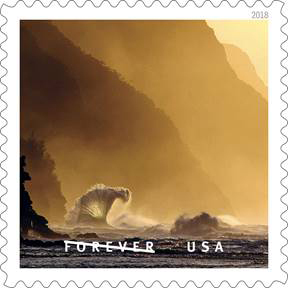 Postal Service will commemorate the issuance of a Forever stamp depicting Kauai’s iconic Na Pali coast at a special event at 10:45 a.m. on August 16 at the Hanalei Post Office, located at 5-5226 Kuhio Highway. This is the first-ever stamp dedication event held on the Garden Isle. The dedication event will feature remarks by Tim Delavega, the Hanapepe photographer who shot the stamp image, Hanalei Postmaster Eileen Brieck and a representative from Kauai county. While a previous USPS stamp featured a Kauai image—Mount Waialeale—this will be the first time that a stamp dedication event has actually been held on the island. This event is free and open to the public. Special hand cancellations of the Na Pali stamp will be provided at the site from 10 a.m. to 12:30 p.m. The Hanalei Post Office will also be selling a limited amount of “O Beautiful” collectible items. 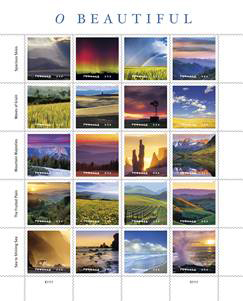 The “O Beautiful” stamp sheets themselves are available for purchase at Post Offices nationwide, online at USPS.com and by phone at 800-782-6724. The event will also serve as a celebration of the reopening of the Hanalei Post Office, which reopened for business on July 30 after having been closed since the record rains and heavy flooding that hit the north shore of Kauai in April. The Hanalei Post Office will serve light refreshments throughout the day of the event to all who stop by, while supplies last.